In the middle ages, the Bible was read aloud as part of church services and during daily prayers, and it was privately for theological study and personal devotion. A variety of aids were developed for these different kinds of reading. For theological study, surrounding the text from the Bible with explanatory notes and / or words written between its lines to help the reader understand obscure or difficult vocabulary and grammar. This is called 'glossing'. This manuscript contains St Paul's Epistles with commentary glosses. It belonged to the Franciscan convent at Oxford. One of the new orders of preaching friars, the Franciscans were part of the scene at medieval universities. This is the beginning of the First Letter to the Thessalonians. 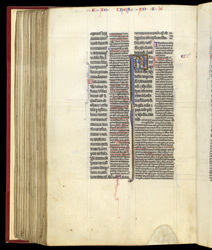 In the page layout typical of glossed manuscripts of the Bible, short excerpts from the Epistle to the Thessalonians are written in large letters. The commentary is written to the side, top and bottom of it, in smaller letters. At the top of the page, the inscription in red cites the author, Jerome, whose writings are excerpted in the commentary. The large 'P' at the beginning of the biblical text bears a picture of St Paul with a monk and a bishop. It probably depicts one of the posthumous miracles of St Paul.